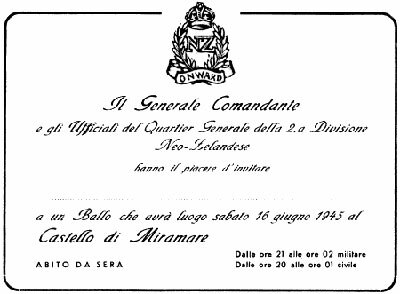 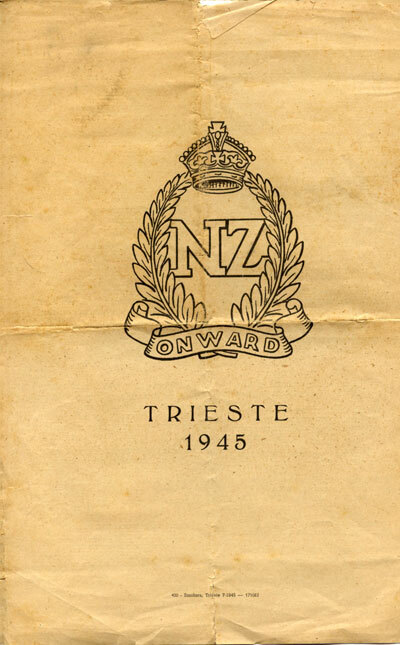 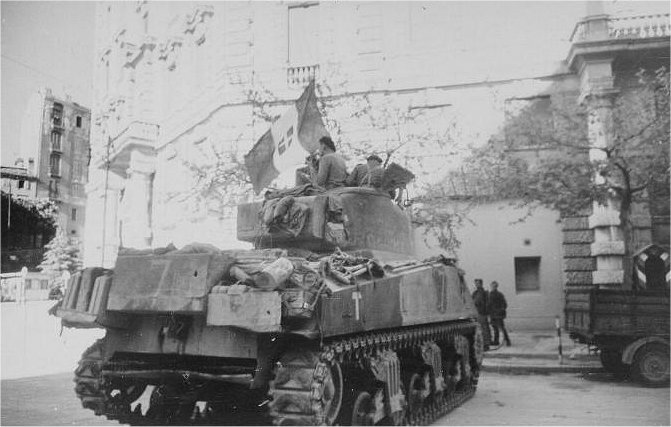 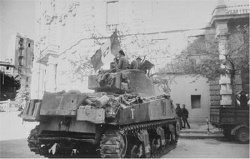 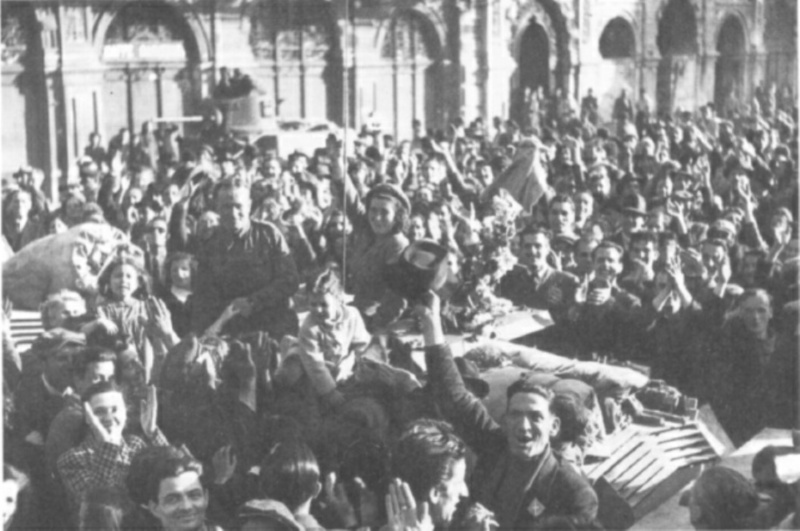 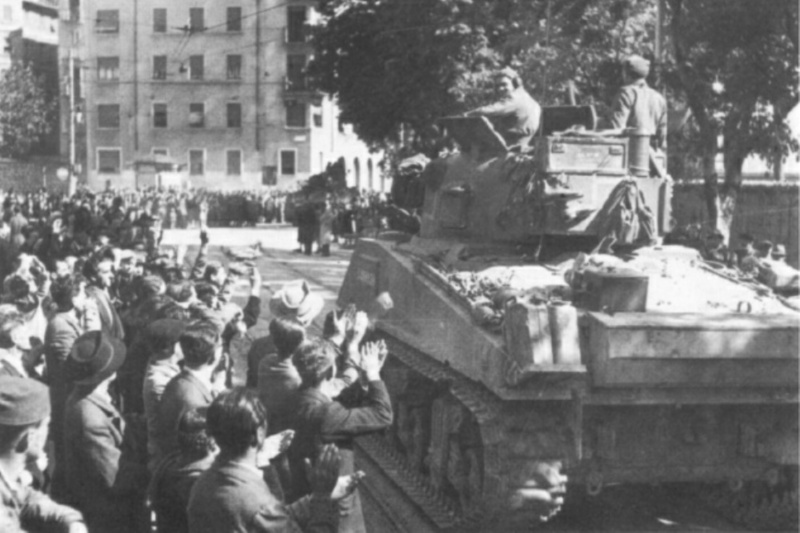 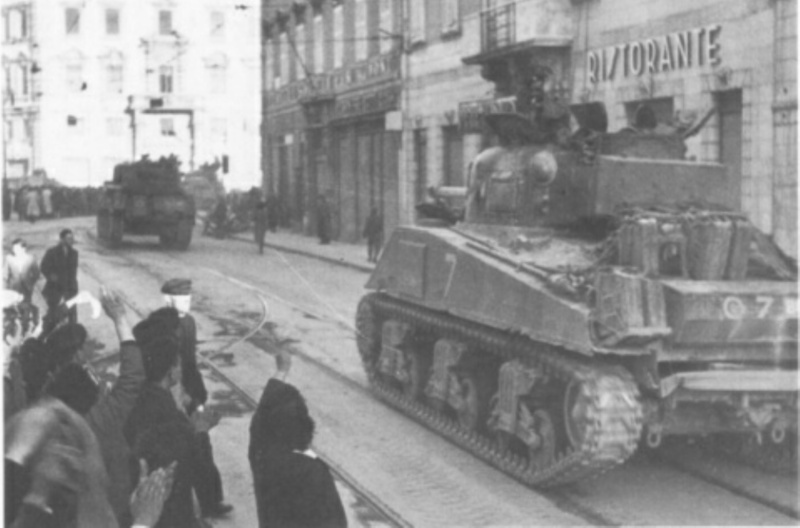 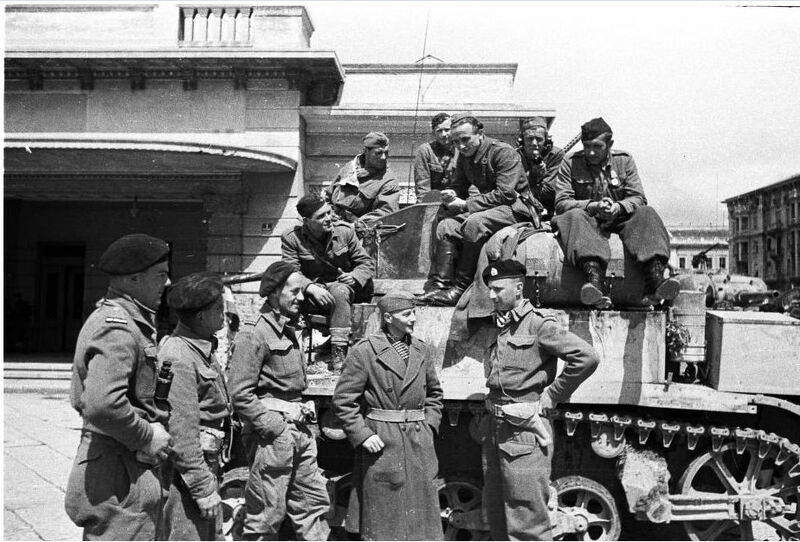 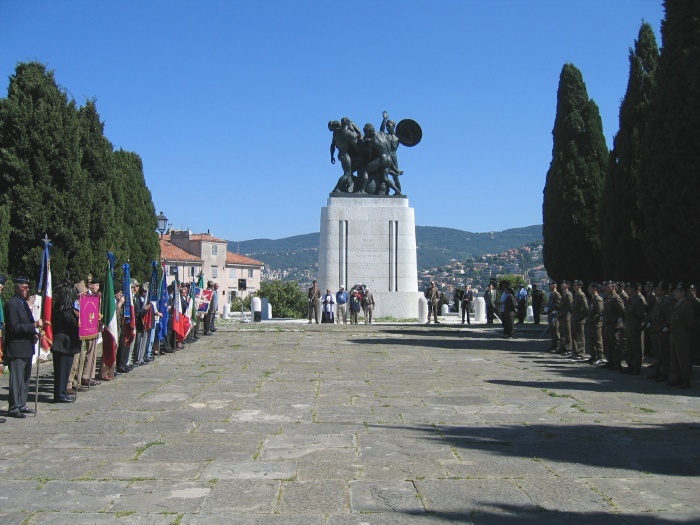 On 2 May 1945 'A' and 'C' Companies of the 22nd Battalion raced northward along the Adriatic Coast towards Trieste. 'B' Company had been left behind for a few days in Venice. 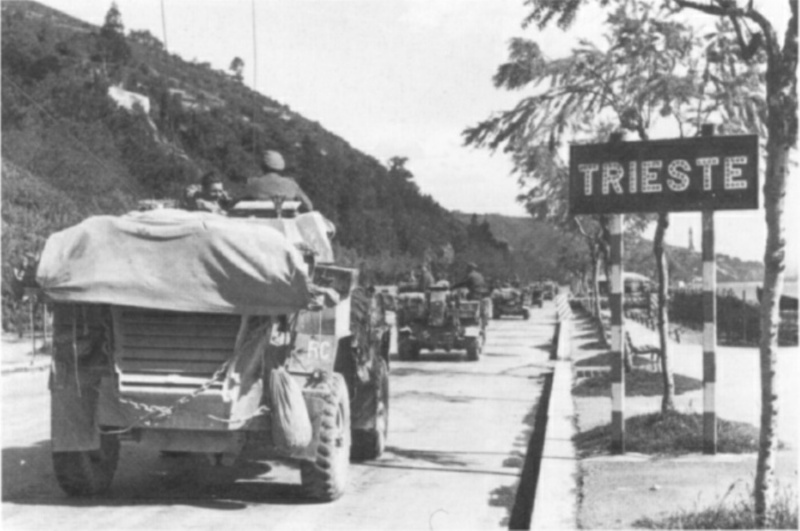 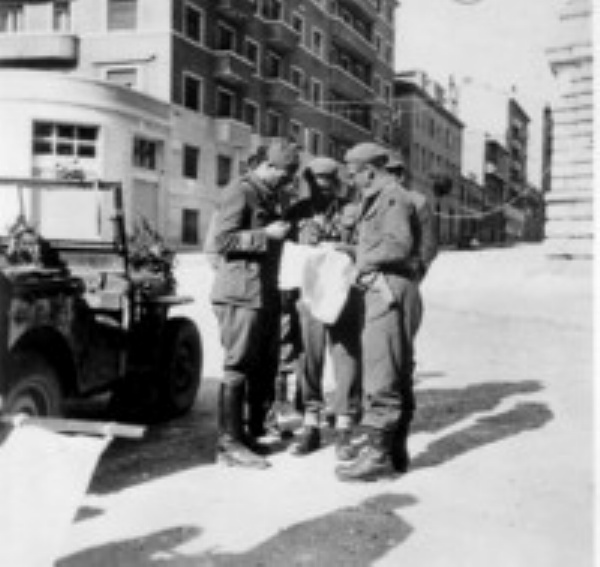 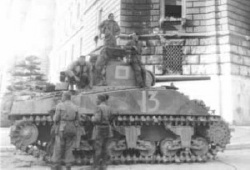 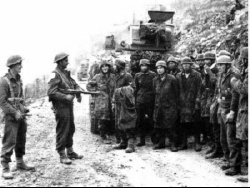 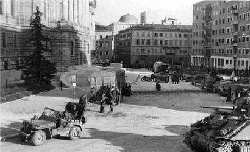 Their mission was two-fold, to enter Trieste and end the war in Italy, and to get there ahead of other elements of the 8th Army, in particular Div Cav who were taking the high road above the town. 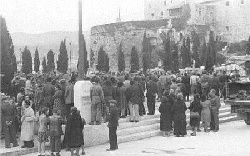 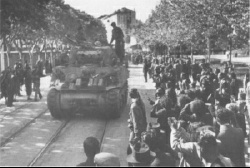 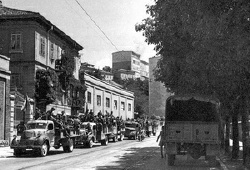 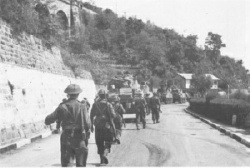 Despite some reports in the official history to the contrary, it was 22 Battalion that entered the city first. 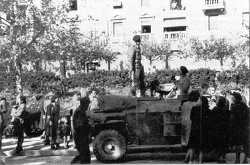 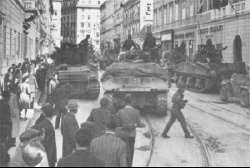 As they entered, they found that the Yugoslav partisans had already arrived, and dealing with them complicated the issues. The narrative recorded on this website has come from the personal recollections of those present on the day. 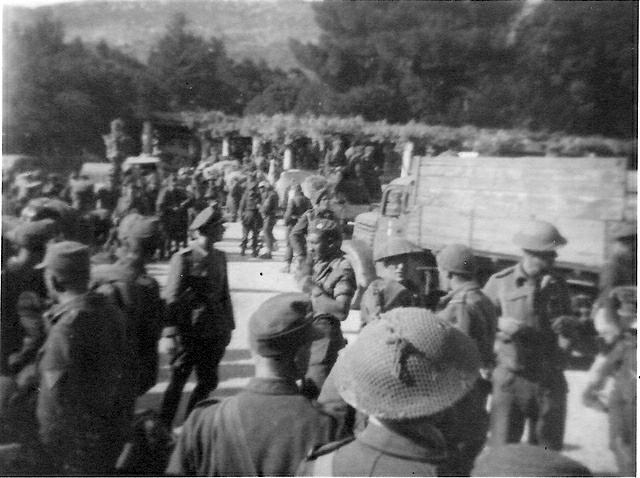 The events are near-identical to the "official" record as written up at the time in the 22 Battalion War Diary, as filed with Div HQ. Images of the War Diary for April and May can be viewed here. I have located a number of photos taken as the New Zealanders entered Trieste, and of the incidents that followed. 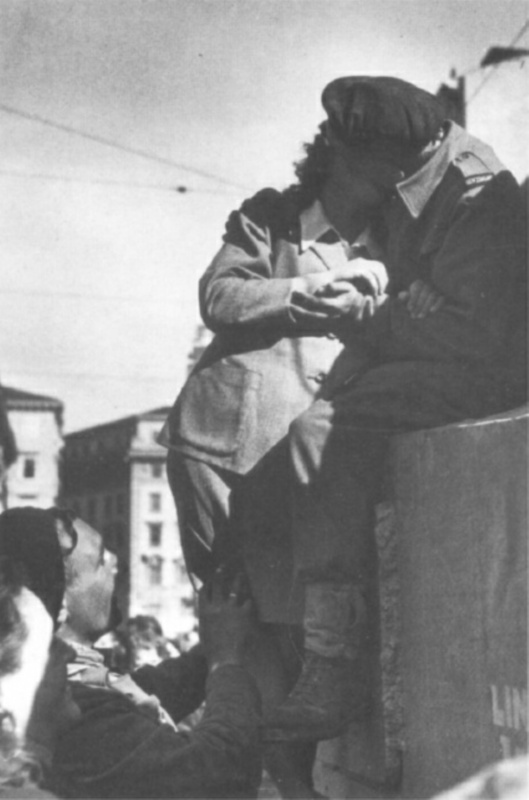 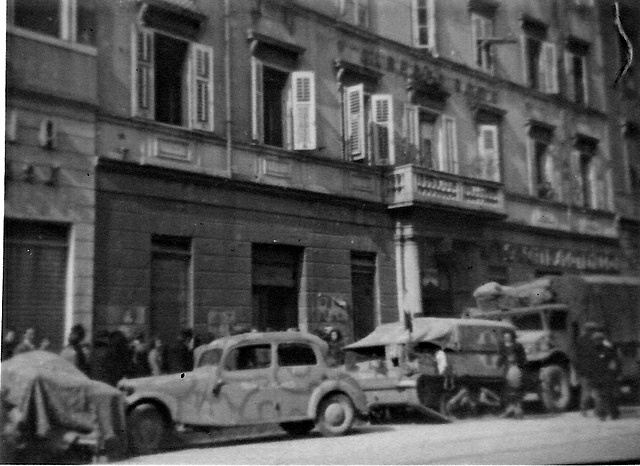 These photos have mostly come from the photo-journalism book "Trieste Diary", wriiten and published in Italian by Sylvia Sprigge. You can view pages of the book here. 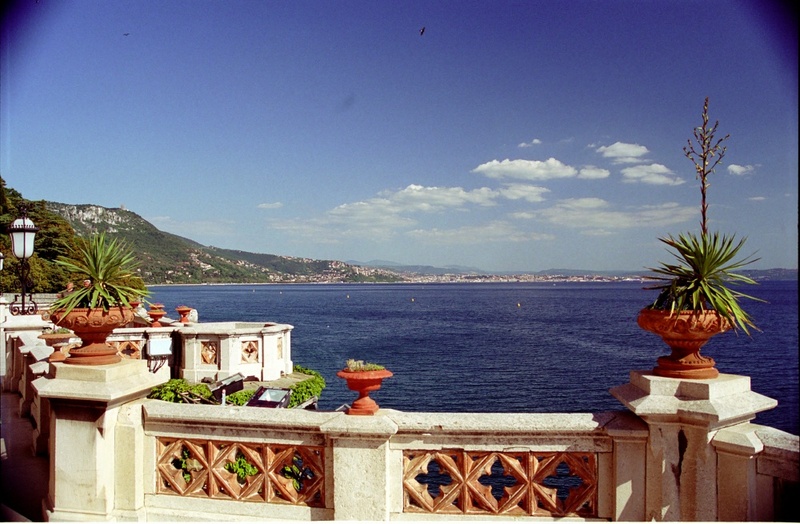 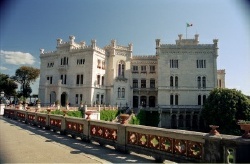 Miramare lies on the coast about 5km south of Trieste. 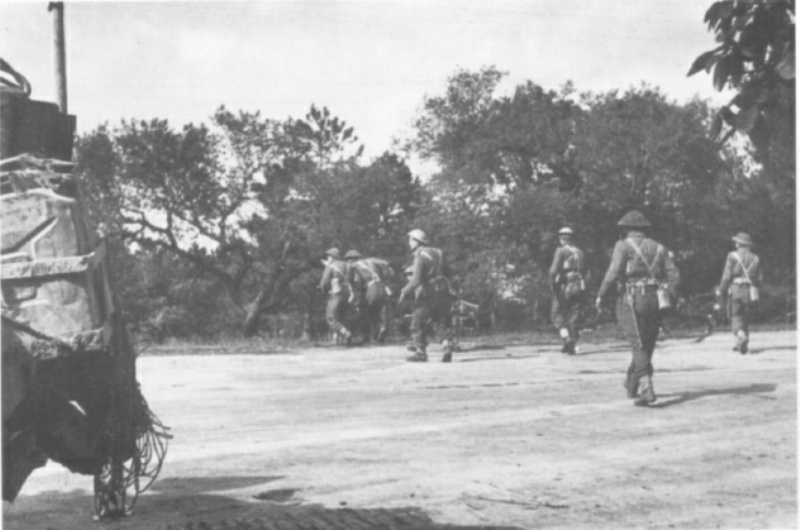 It was the HQ for a German Division, but they quietly surrendered to A Company of the 22nd, prompted in part by a severe pounding of the surrounding air defences by several squadrons of bombers. 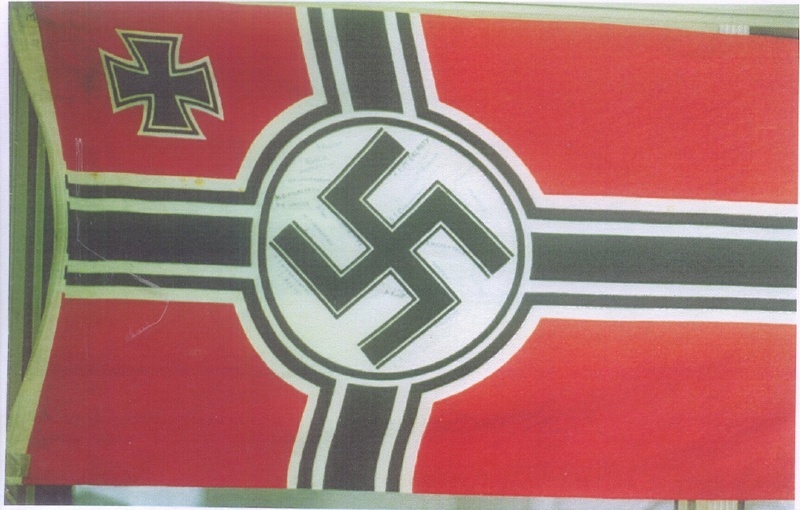 The large German flag that flew over the castle was removed by A Company, who all signed their names on it. 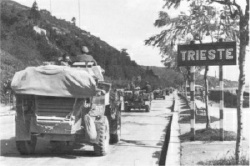 The flag is now on permanent display in the Waiouru Army Museum. 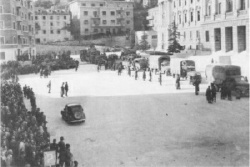 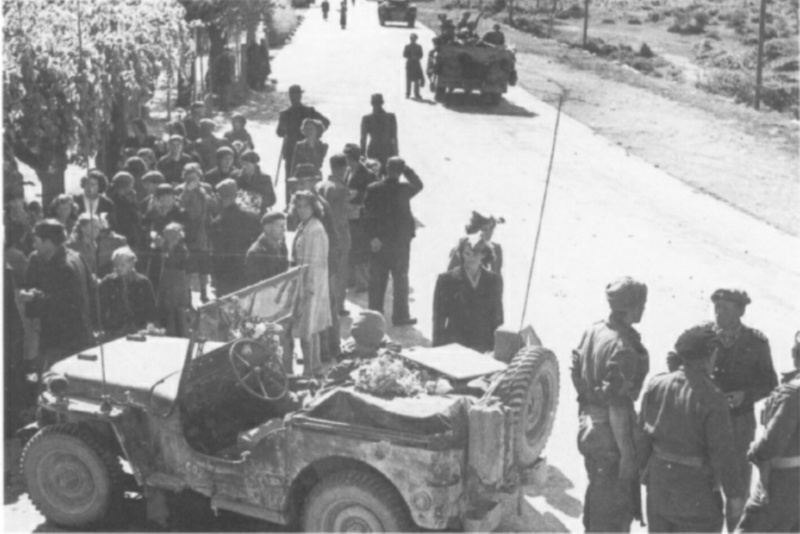 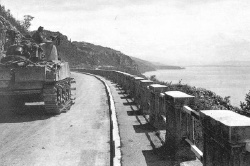 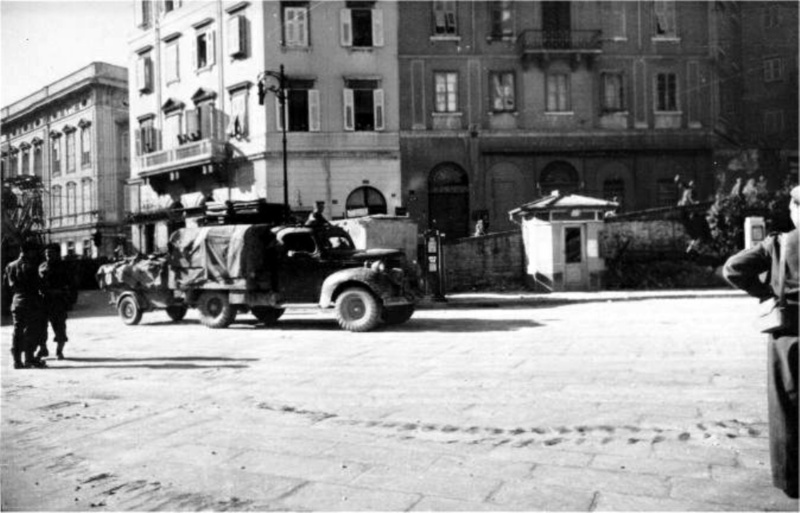 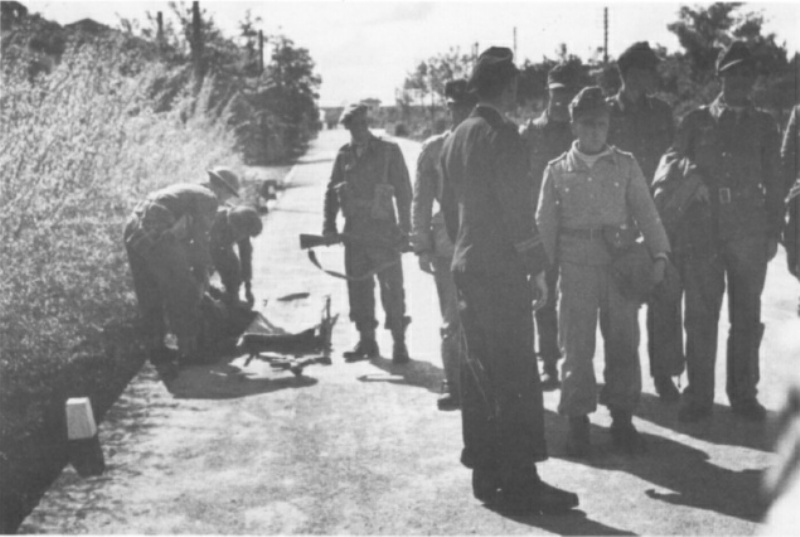 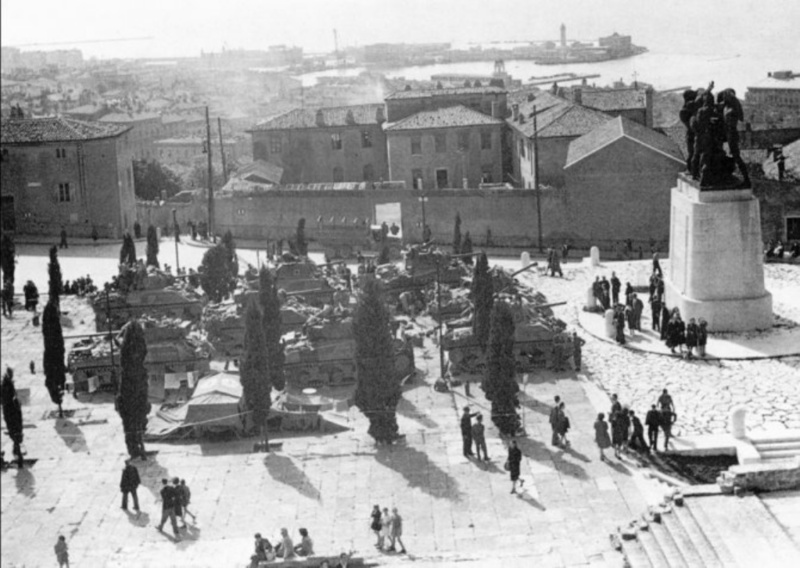 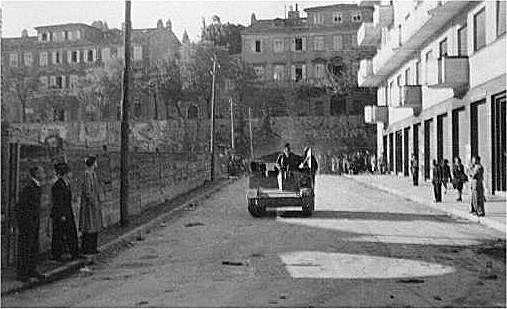 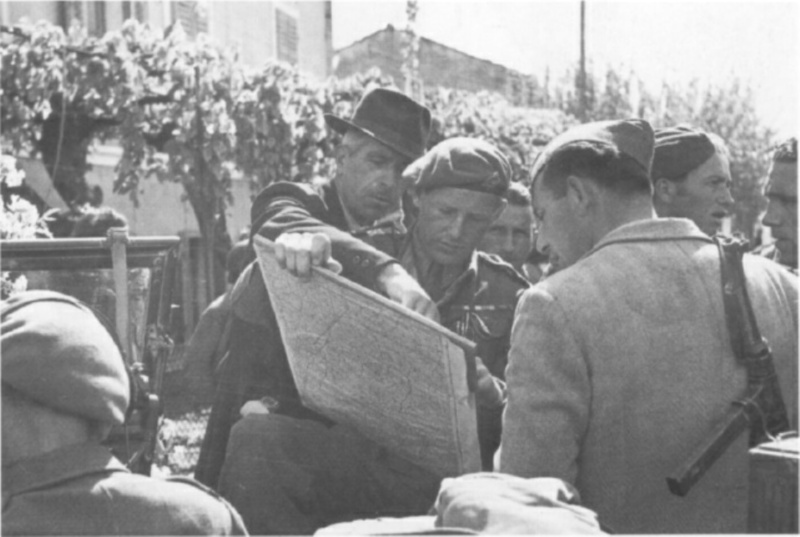 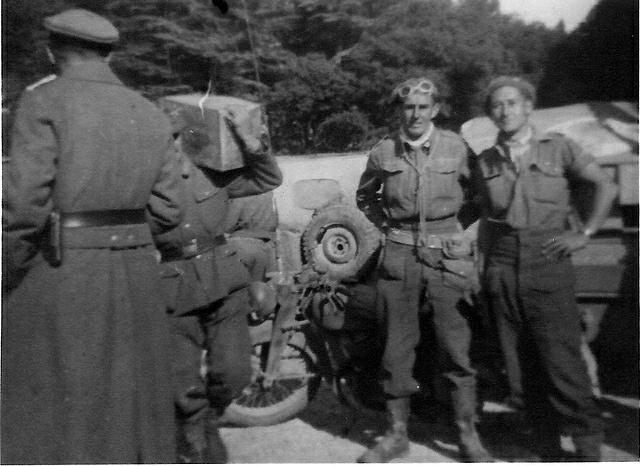 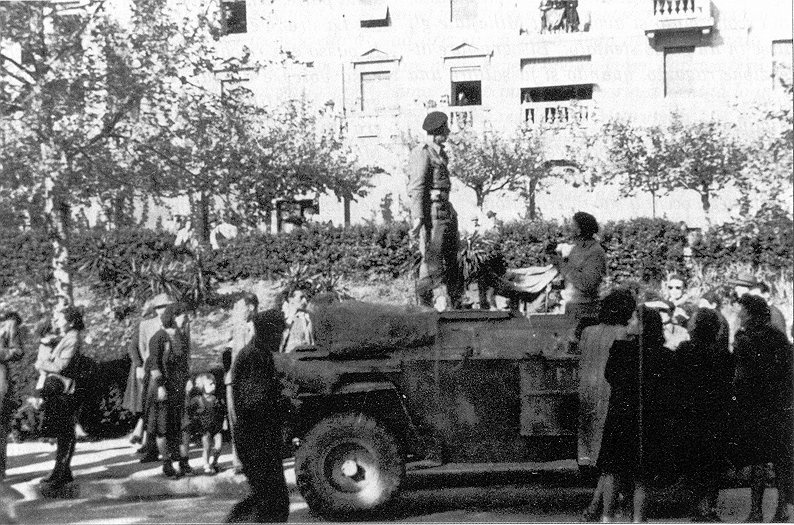 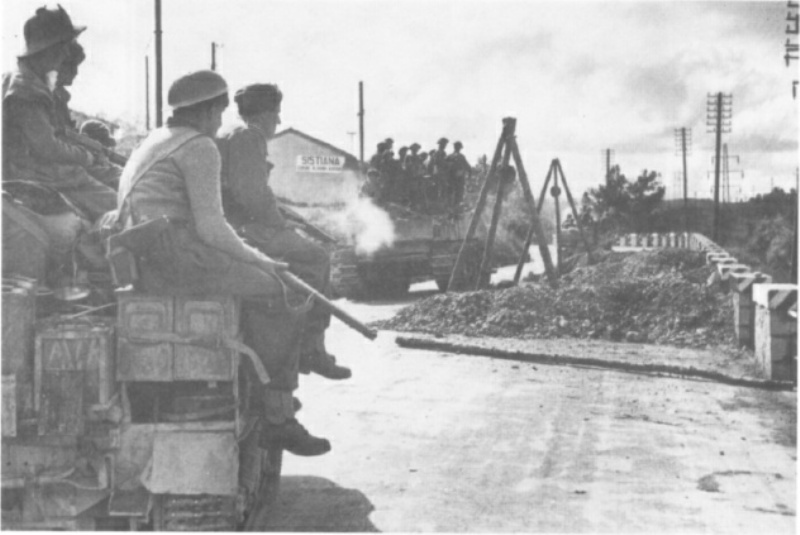 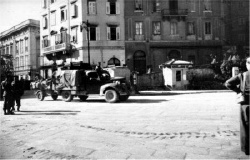 The 22nd Battalion was stopped at a number of points on the road into Trieste, clearing roadblocks and dealing with Germans only some of whom wished to surrender. 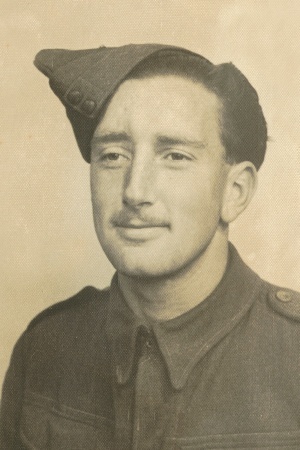 Eventually LTCOL Haddon Donald was approached by a group of Germans which included an officer and radio operator. They accompanied Haddon into Trieste, navigating and advising local German units of their arrival. 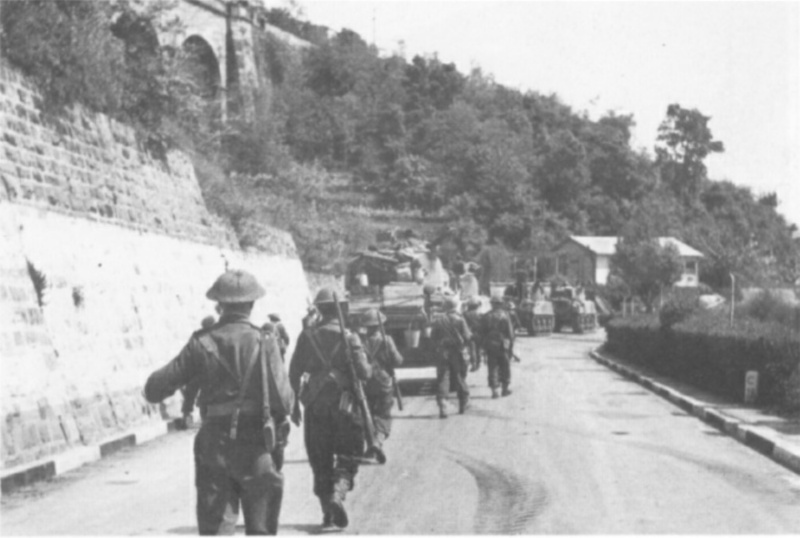 The 22nd Battalion was accompanied into Trieste by the Lancers and some armour, both under Lt-Col Donald's command. 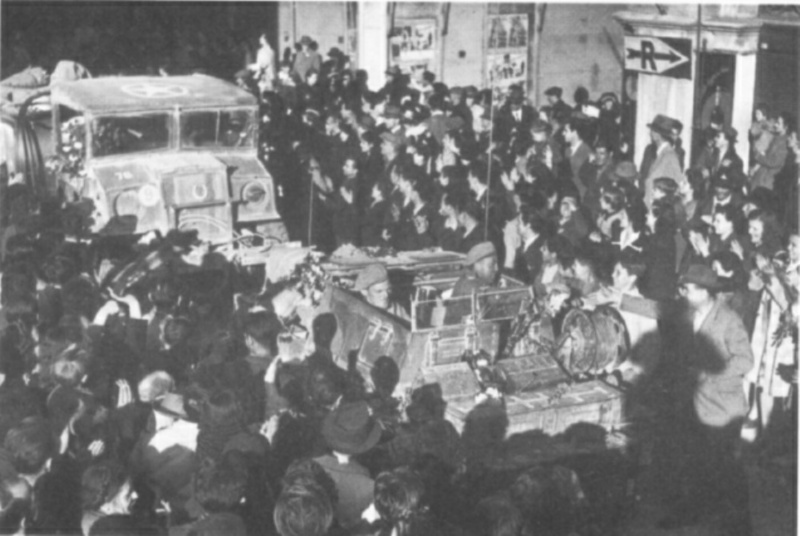 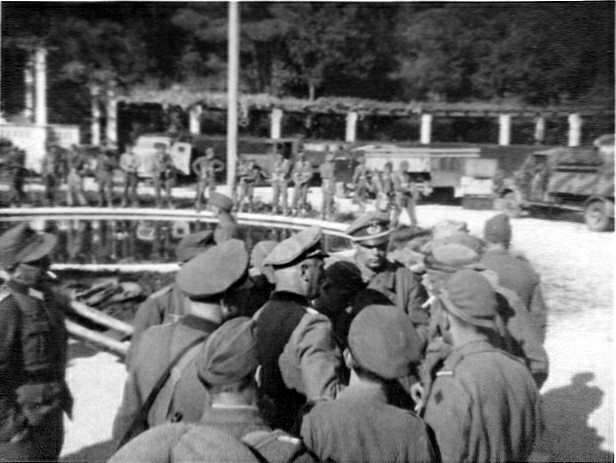 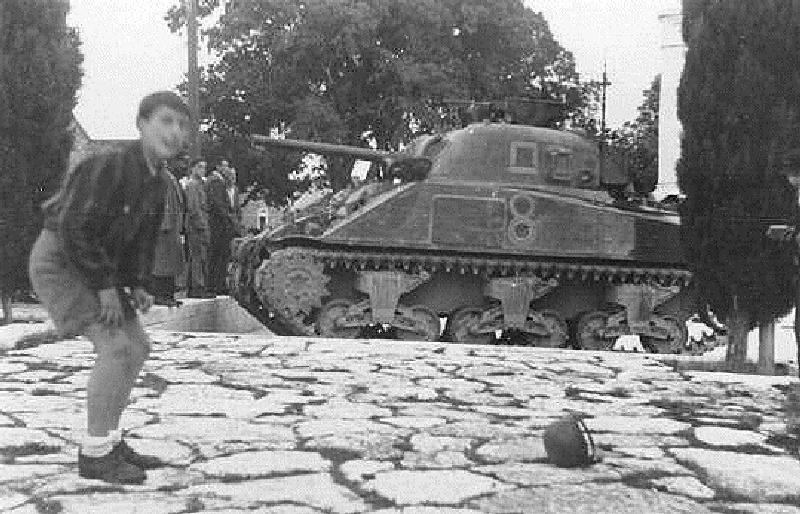 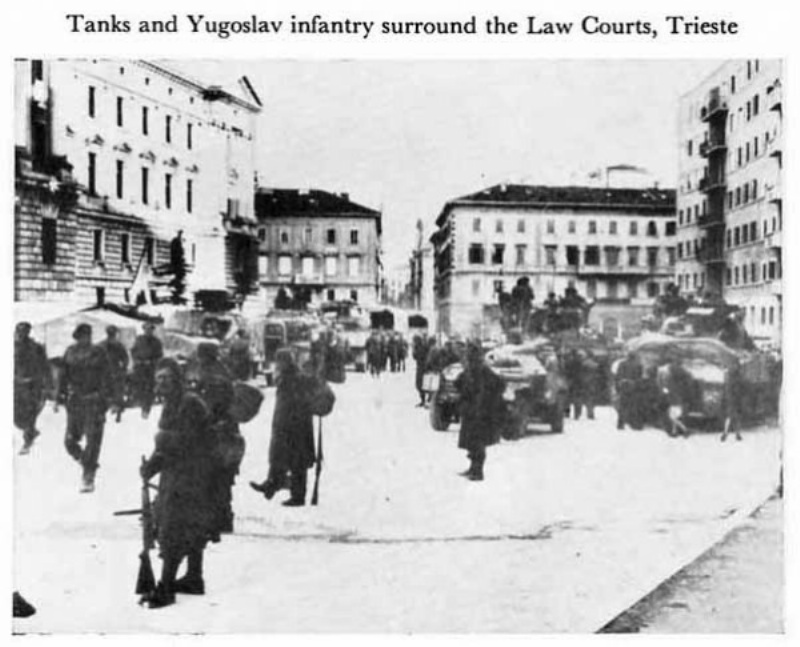 They were welcomed by the Triestini, but the Yugoslav partisans were less keen, althought here are several photos showing the two forces geting on well enough together. 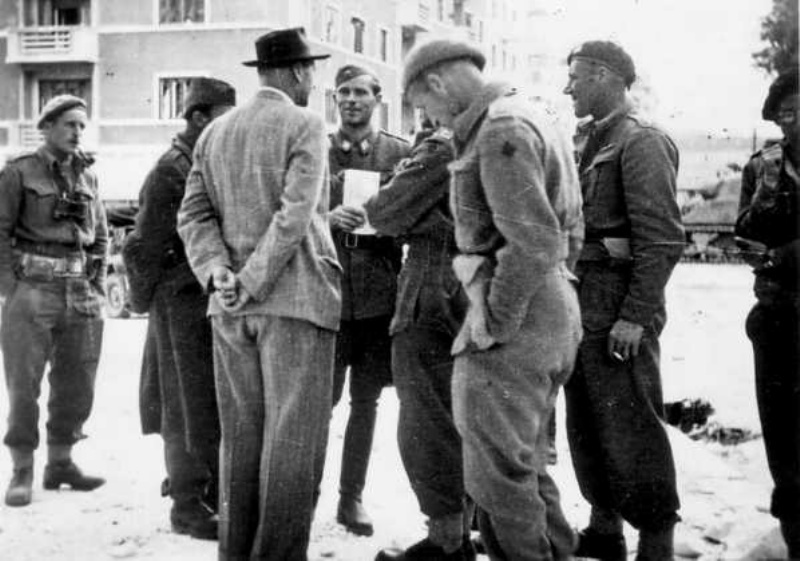 "At the Tribunale Donald could not persuade the garrison commander to surrender; he was an SS officer who was still humbugging undecidedly and was apparently under the influence of alcohol. 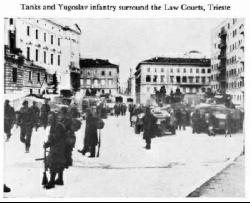 Donald therefore arranged with the Yugoslav commander that tanks of C Squadron of 19 Regiment and C Squadron of the 20th would surround the building and give it a 20-minute pounding with their guns and Brownings. 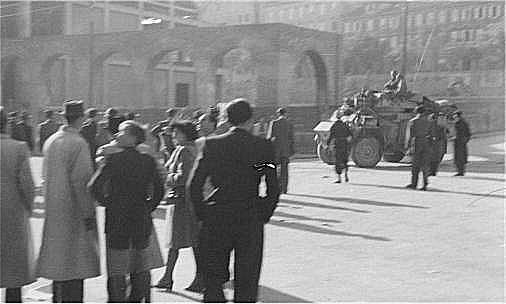 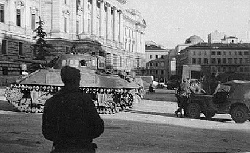 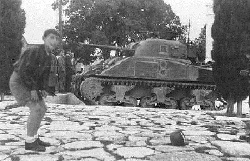 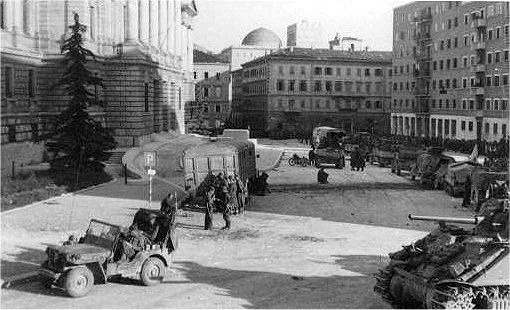 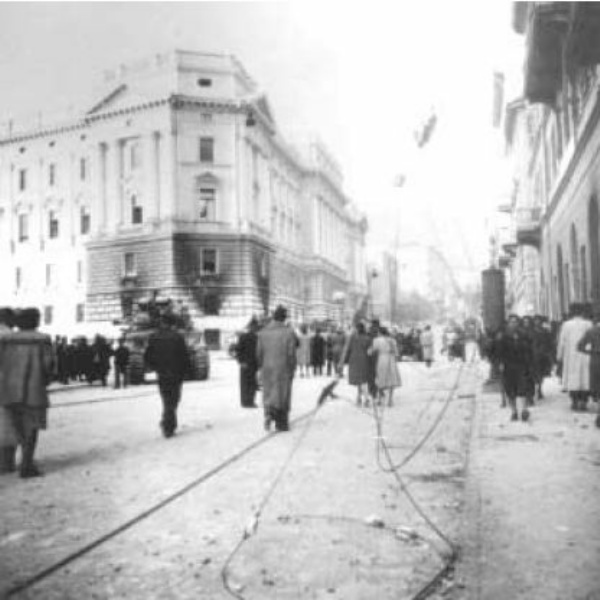 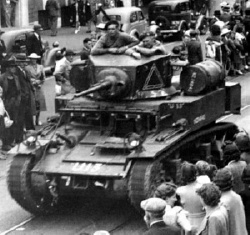 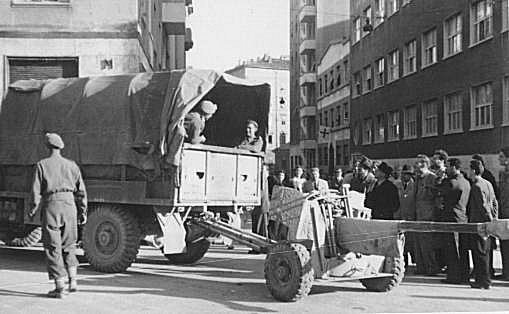 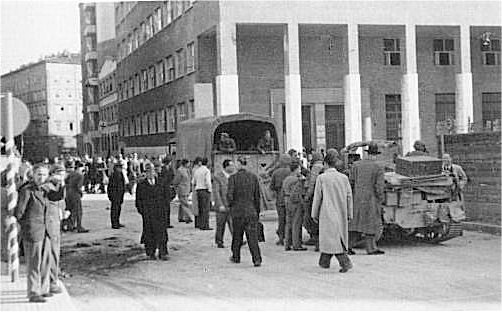 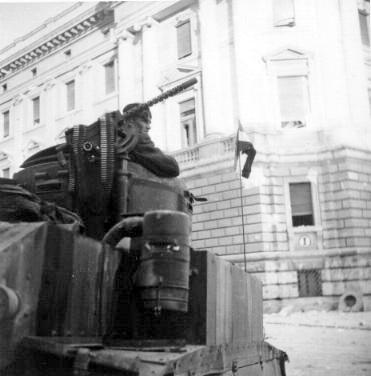 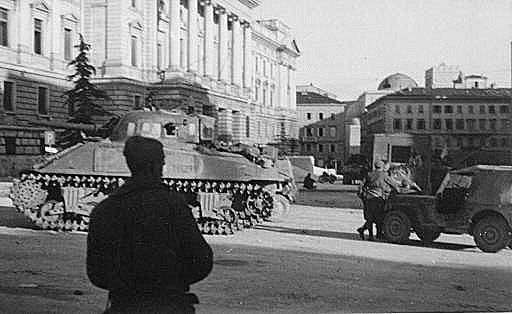 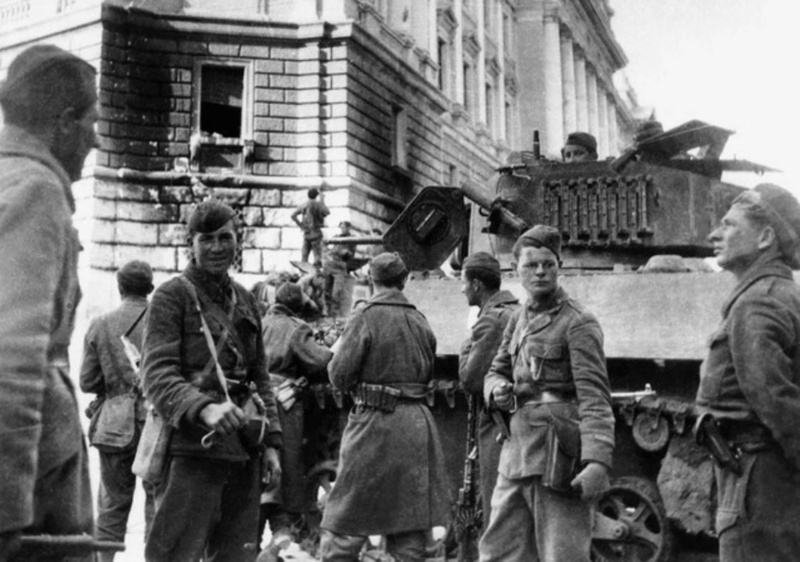 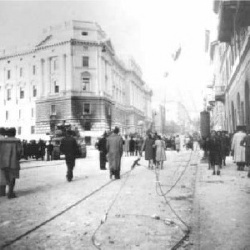 First the square was cleared of all troops and civilians, and at 7 p.m. 18 tanks at ranges of from 20 to 50 yards blew gaping holes in the walls and through the windows of the Tribunale. 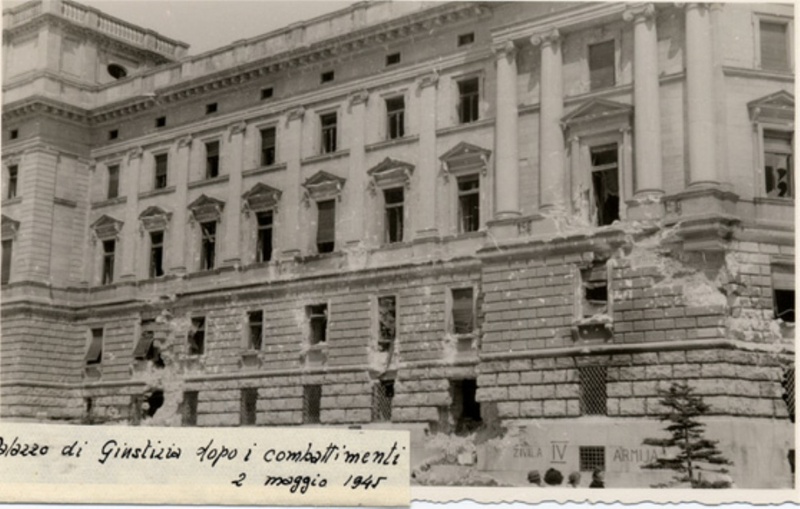 The Germans took shelter in the cellars and had few casualties, but the Yugoslavs entered the building and by morning had rounded up some 200." "....I decided to try on my own to persuade them to surrender. 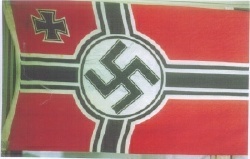 With no flag of truce available, I made do with my handkerchief, which was white and reasonably large... 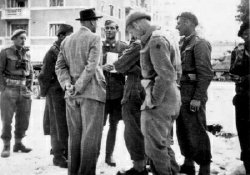 I knew enough Italian and German to be able to explain who I was... and we would give them safe conduct back to a British prisoner of war camp.....They stepped back inside and slammed the door." "I was fast losing patience with the SS types in the Tribunale, but decided to have one more go at offering then safe conduct.... Terry McLean, my adjutant, could speak some German and by this time an Austrian civilian had joined us to act as an interpreter. 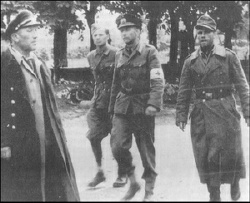 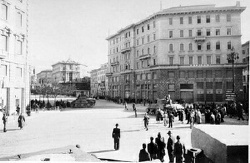 The three of us, under a better constructed white flag marched once more across the Square to parley with the Germans." 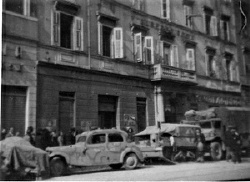 "I gave the order to fire and keep firing until we had blown several entries into the building.... 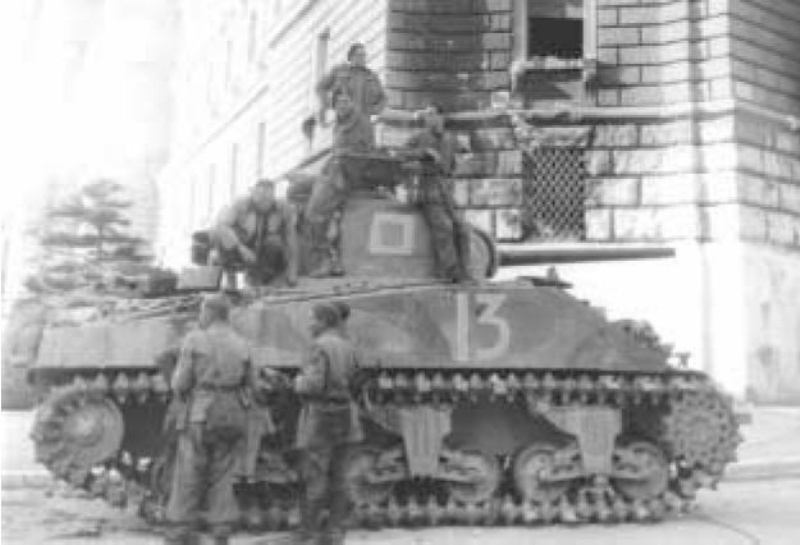 The tank boys were having a wonderful time. 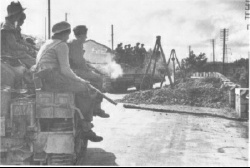 Never had they had such an easy target and nobody was shooting back at them." 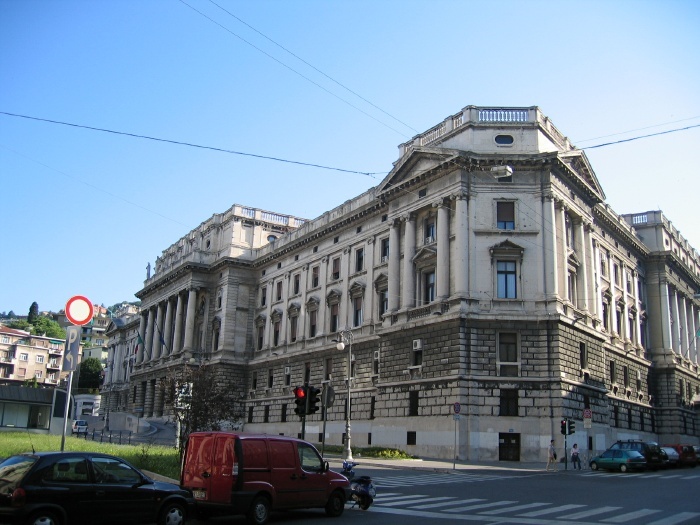 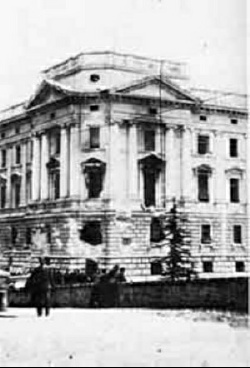 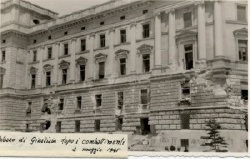 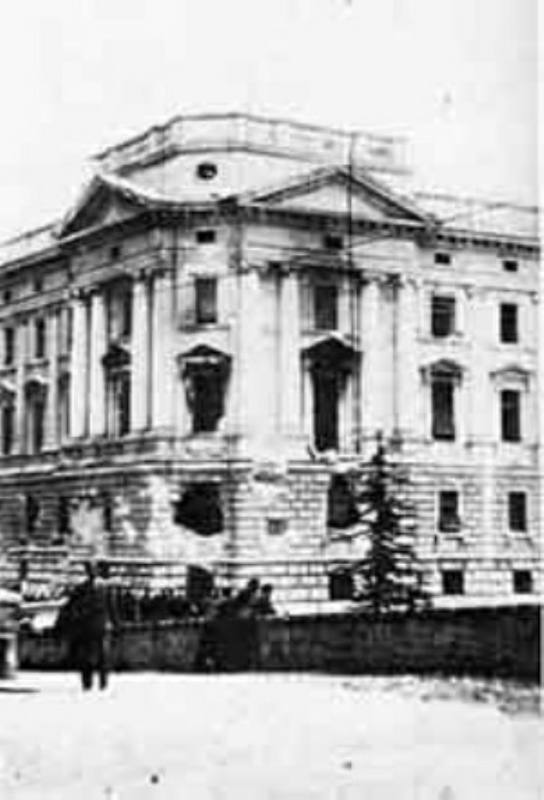 The shelling of the Tribunale was one of the few incidents of damage inflicted by the New Zealand troops on arrival at Trieste. 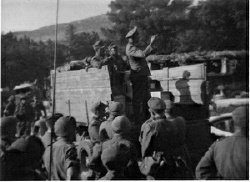 A few photographs survive from the event. 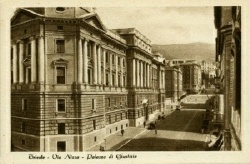 A postcard of the Tribunale pre-1939. 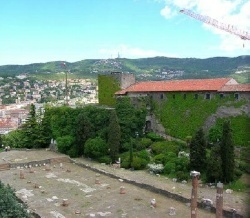 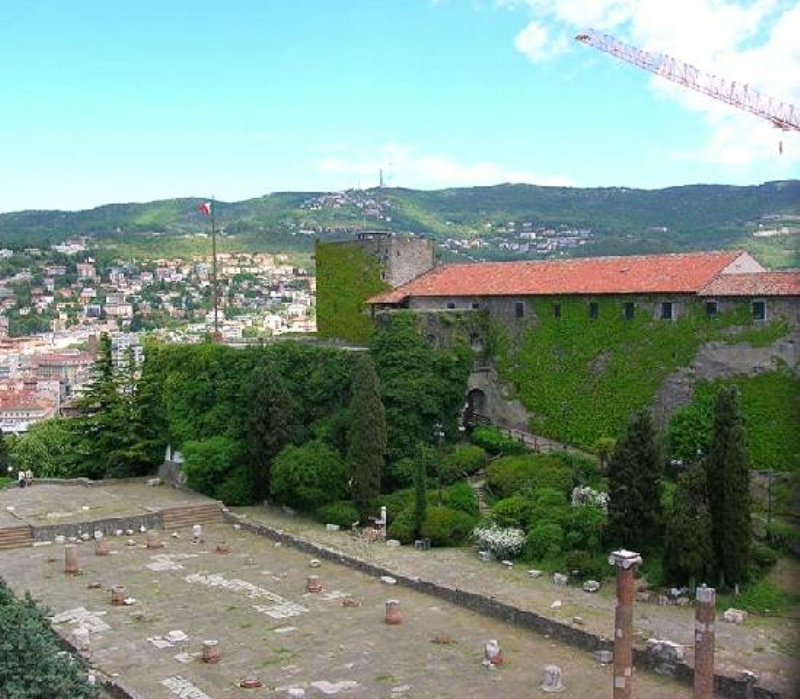 Overlooking Trieste and its harbour is the ancient castle of San Giusto, lying next to the cathedral of San Guisto. 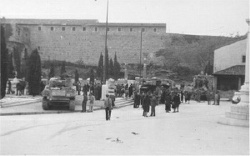 The castle housed a German garrison and as they occupied a commanding position over the city, Haddon Donald decided they needed to be removed as soon as possible. 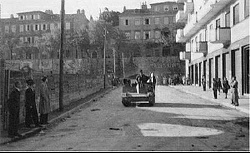 He sent C Company, led by Major Lloyd Cross, up to the castle where they met the CO, an Admiral. 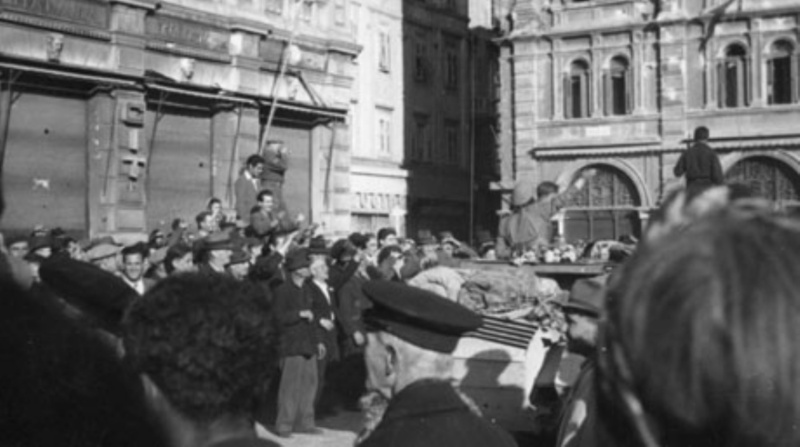 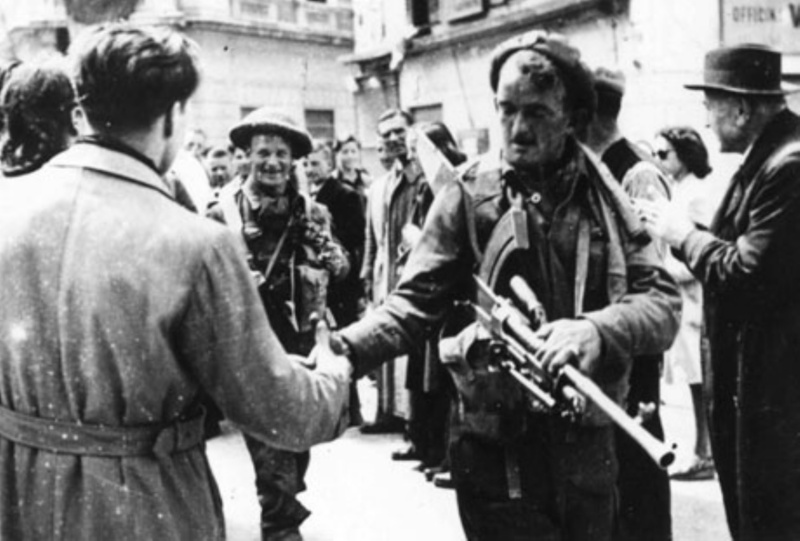 He was willing to surrender but the Yugoslav partisans had other ideas, threatening to shoot any person, German or Allied, who left the building. As Major Cross only had a depleted company, and no tanks or armour, he decided to stay in the castle until relieved. 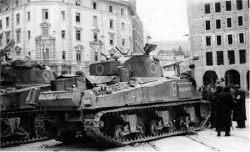 The Admiral pointed out that the Kiwis only had a small force whereas the Yugoslavs had a heavily armoured force. 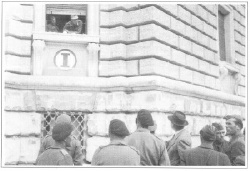 Disretion prevailed, and although the Germans piled most of their arms into a room, sentries were posted around the castle that night of Kiwis alternating with Germans - a most bizarre end to the war. 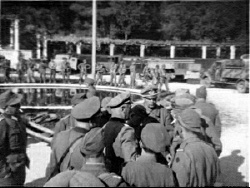 But as Major Cross pointed out to the Admiral, his troops had not eaten since breakfast and they had not brought rations with them. The Admiral sat them down to eat with his men. 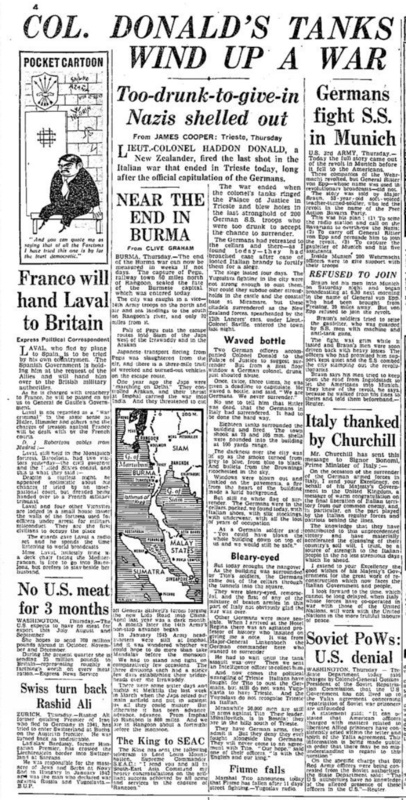 The menu was stew - made from horsemeat. 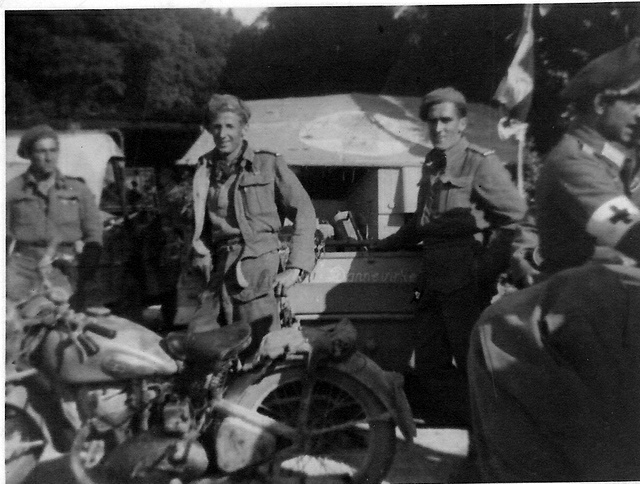 Major Cross dined with the German officers, and they had stew - from horsemeat, washed down, not with Italian wine or good brandy, but Scotch whisky, the last remnants from the fall of Tobruk. A company of the 22nd Battalion proceeded to the 750-year-old castle of San Giusto, the ancient citadel of the port, to receive the surrender of nine officers and 260 men. 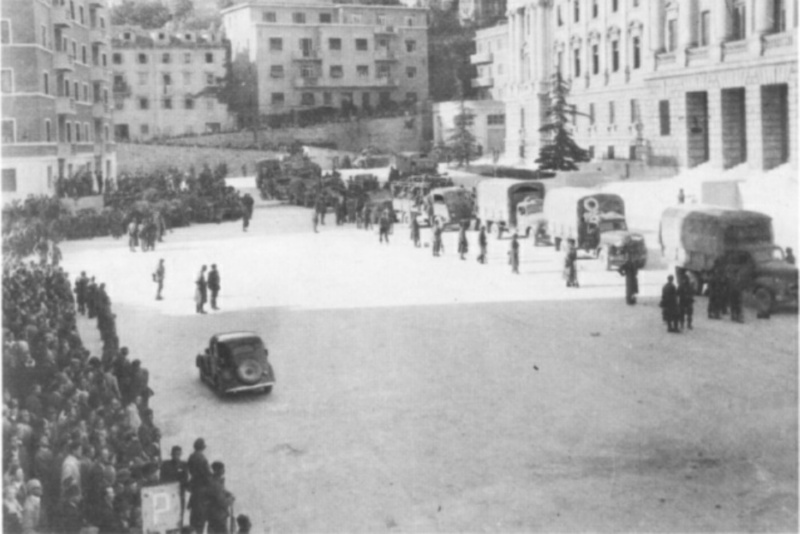 In the central courtyard, the company drew up opposite the paraded garrison, and returned the salute in a ceremony which had all the appurtenances of a military occasion. 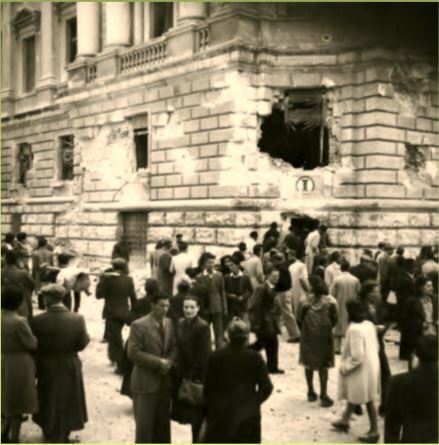 Bullets from Yugoslav snipers pattered against the old walls. 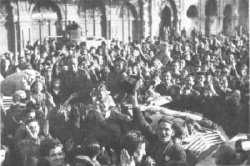 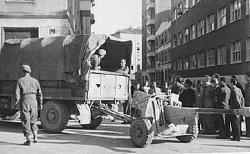 As the prisoners moved out the following day partisans demanded that the Germans be handed over to them. 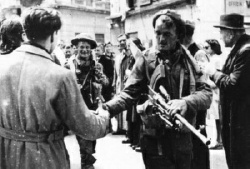 Tactful handling prevented trouble. 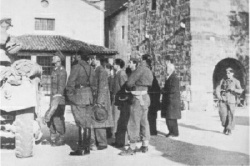 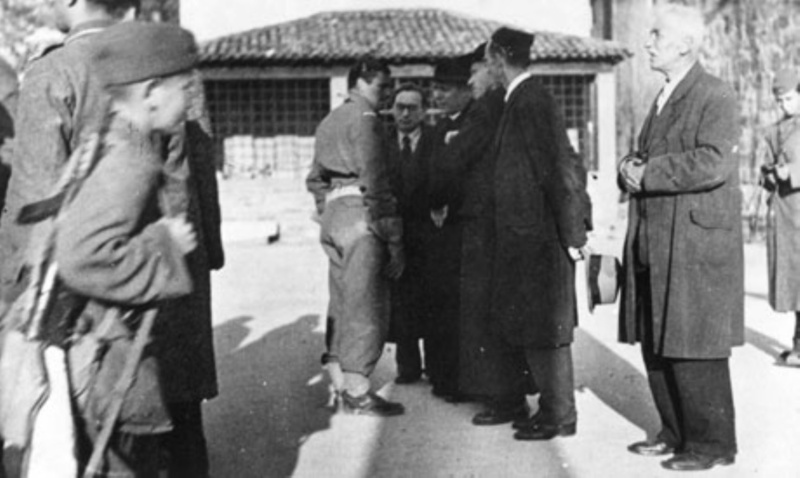 Monsignor Santin assisting with the German surrender. 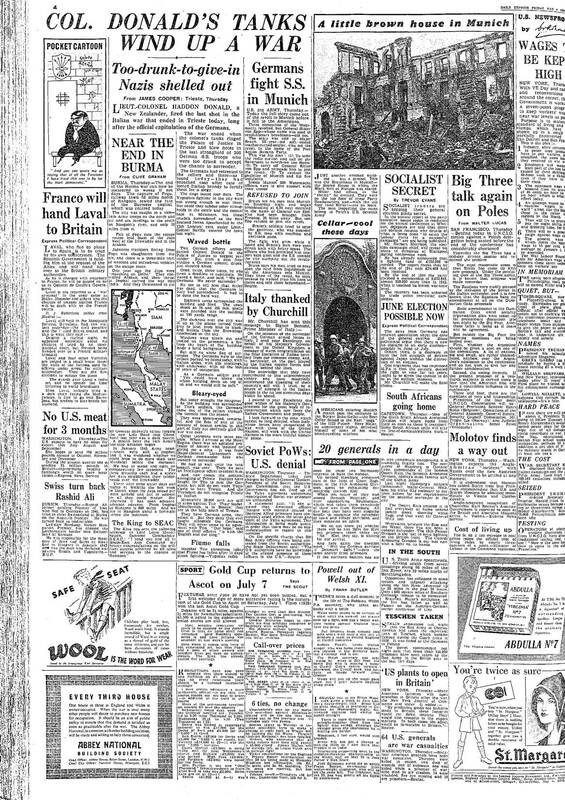 Here is the article from page 4 of the London Daily Telegraph of 4 May 1945. 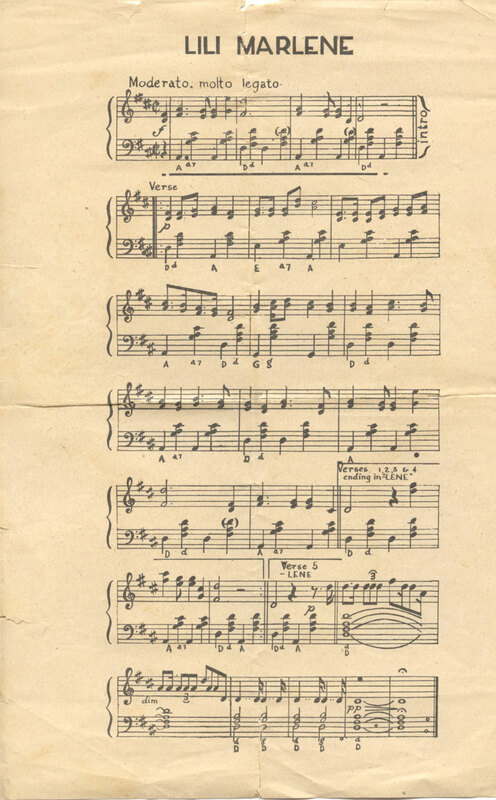 You can also download the whole page as a PDF file here. After the fall of the Tribunale Building, and the formal surrender of all German forces in Italy to Col Donald, there was still a garrison of German soldiers at the Villa Opicina, overlooking Trieste. 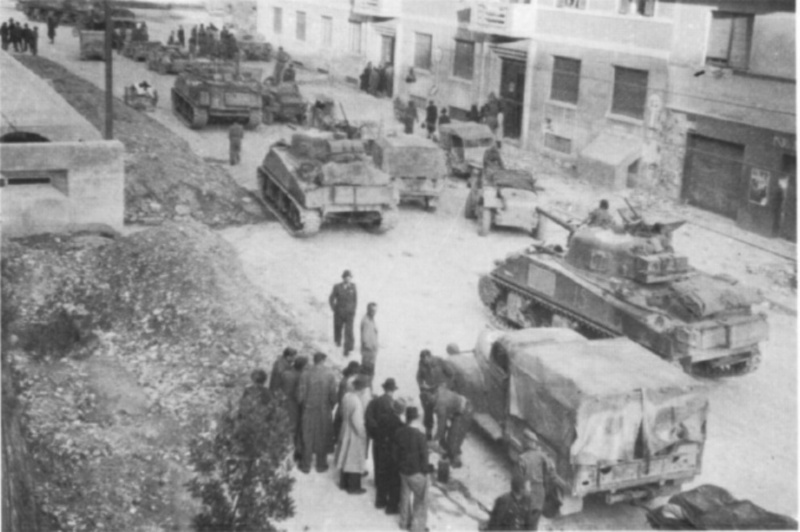 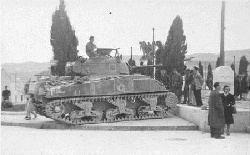 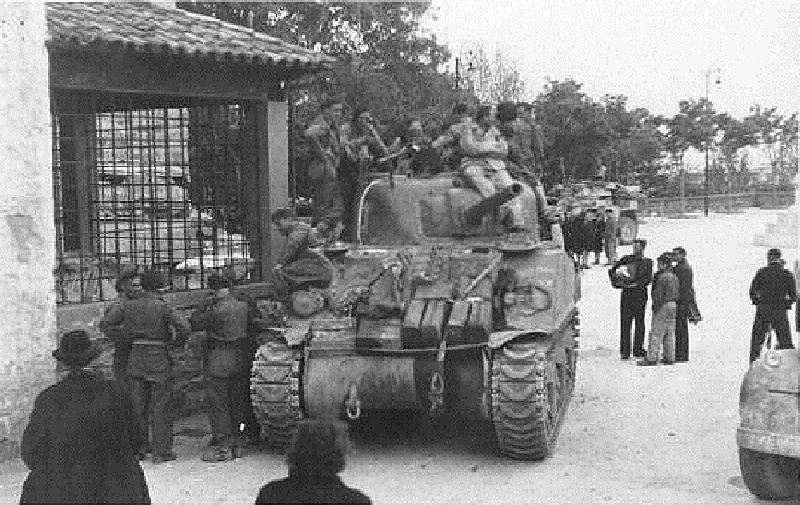 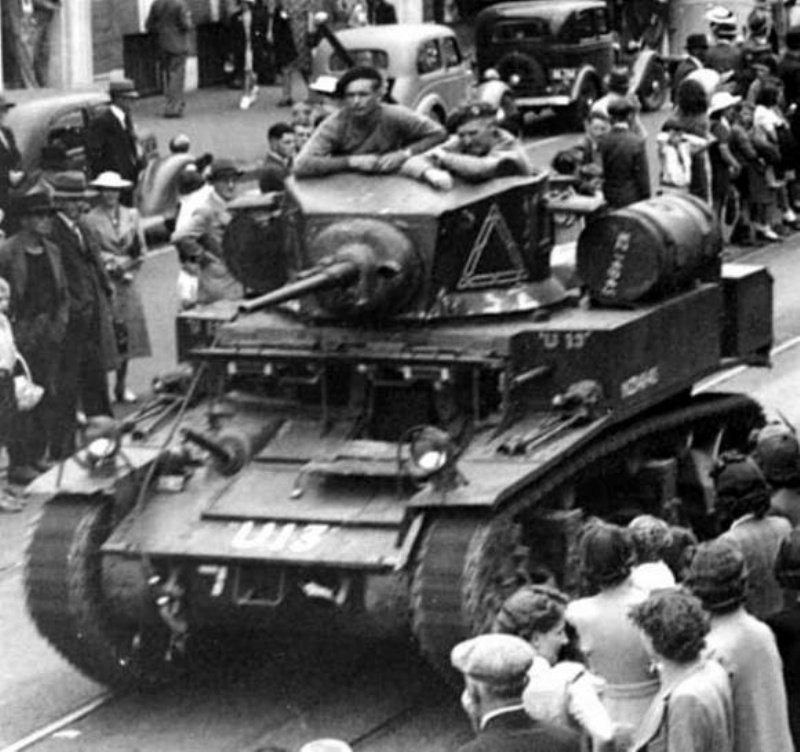 The German commander sent a message to Col Donald that he wished to surrender to the New Zealanders, so Haddon sent part of A Company with some tanks and trucks up to the Villa. 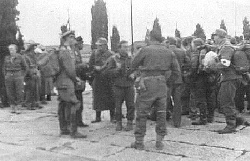 Once there they found the place surrounded by Jugoslav forces who wished to capture the Germans. 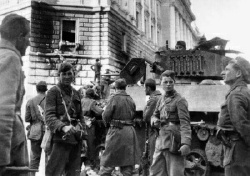 During the negotiations, the Jugoslavs lobbed a mortar into the town square wounding one Kiwi and killing Lance Corporal John Russell. 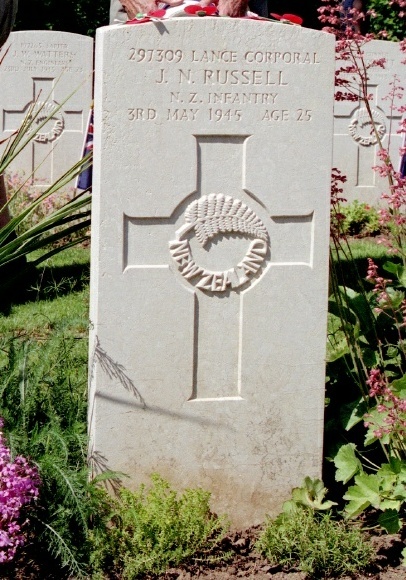 He became the last New Zealand casualty of the war, and the first casualty of the Cold War that developed from the standoff between Juoslav and Allied forces in Trieste. 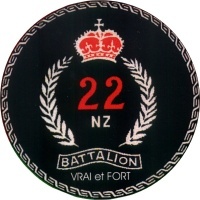 The men of the 22 Battalion were particulary aggrieved at the loss of L/Cpl Russell. 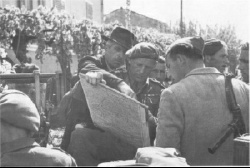 It is a lasting testament to their professionalism that they did not return fire. Private Russell's headstone at Udine Cemetery, Italy. 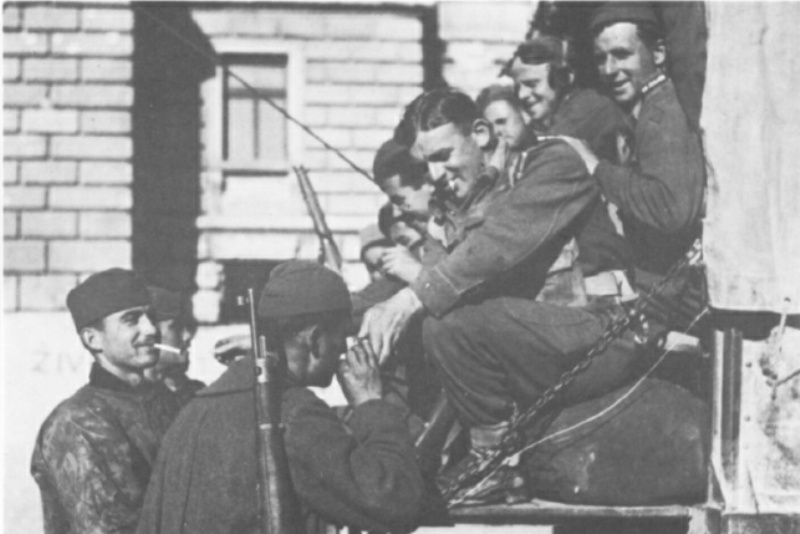 There was time to relax (but not too much with the Jugoslav partisans still causing trouble). 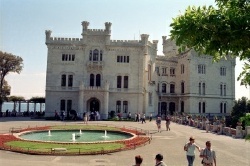 There was a famous Ball, held at Miramare Castle, and some new words penned to the tune of Lili Marlene. 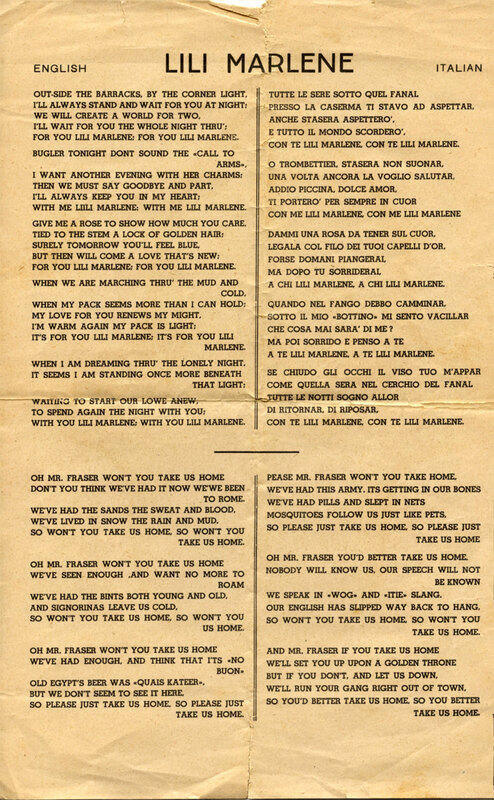 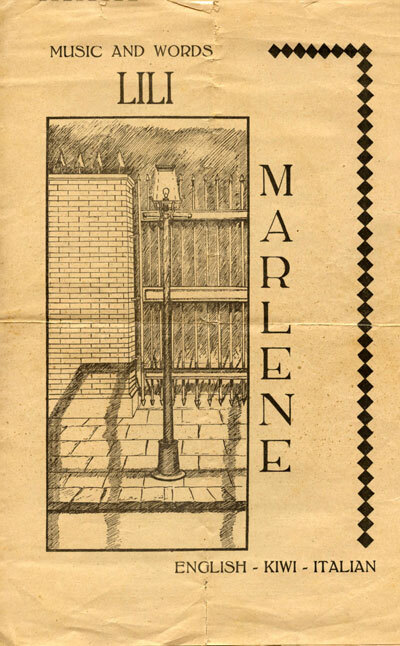 The song was published as a broadsheet, and is reproduced below.